Host Linda “Brasse” Carlson (Director, Global Community Relations) will interview Jonathan “Prathun” Caraker (EQ2 Game Designer) and Akil “Lyndro” Hooper (EQ2 Lead Designer) and learn all about the upcoming changes to Freeport. Are you wondering what this historic city will look like, what new quests are on the way, or how our designers come up with it all? You won’t want to miss this exciting webcast! Also, don’t forget to check out this recent article on the Freeport Revamp, which interviews Timothy “Haohmaru” Heydelaar (EQ2 Art Director) about the aesthetic changes to Freeport. Join us on Thursday, November 3, 2011, at 4:30 p.m. US Pacific Time, as we live stream this webcast on the SOE channel on Stickam! You can also tune in through the Stickam tab on our Facebook page. The webcast is expected to last about 20 minutes. With the Everquest II: Age of Discovery expansion just around the corner, it’s the perfect time to give players the inside scoop on what exactly is going on with the Freeport re-design. EverQuest II Community Relations Manager, Jennifer “Isulith” Bridges got the chance to sit down with Timothy Heydelaar, Senior Artist for EverQuest II. He was able to give a great overview of what to expect and why the changes to Freeport were made. The Freeport City revamp is coming winter 2011 with Game Update 62, which is coming out at the same time as the new expansion: Age of Discovery! It will be available to all players. So, you’re probably curious how EQII will be growing and changing in 2011, right? Well, it’s finally time to share. This year is all about content and entertainment and we intend to give you plenty of both. The following outlines some of the broad strokes to get you thinking about what’s coming…and possibly just a little excited, as well. First of all, if you’re a “Destiny of Velious” owner, you’re going to be *extremely* happy that you made that purchase. Why? Because DoV is going to be the biggest, best expansion that has ever been made. We’ll be releasing content on a regular basis that continues to tell the “Age’s End Prophecy” saga, and the only price of admission is that you own DoV. The Age’s End story gets really big before it’s done and it’s going to take us a good chunk of time to tell it all, but we’ll do so by releasing chapters of it every few months and building the story a bit at a time. Velious is a big place, and so is this story. It’ll be a good ride. Secondly, we’re going to revamp Freeport and make Evil an exciting place to be. Freeport (and next year, Qeynos) will become multi-level adventure hubs with instanced content at many levels. The city itself is also getting a facelift as Freeport reorganizes itself to retake its place as a driving power of the world. Additionally, it’s becoming a single zone (instead of many sub-divisions) and flyable. When we upgrade Qeynos, it will get the same visual upgrade and zone treatment, and will bring back the “Greater Good”. The Gods of Norrath will be returning to once again directly muck about with the lives of mortals. Too long has the world of Norrath spun along on its own axis. It’s time again for it to feel the touch of the divine. On the non-content side of things, we’re going to be working on a lot of stuff “under the hood” to make your gameplay better. We’re looking into ways to increase the speed of our game and graphics engine, some of which could be very significant, which would obviously make raids and public quests a lot more fun, as well as boosting smoothness of gameplay for everyone. We’re revamping the way that our terrain is created so that we can bring you content more quickly, but still with high quality, thus increasing how big the world can become. And last but not least, we’re crafting a host of new features and fun ways to play the game. Some of our current ideas are way outside the box for an MMO and we’re pushing hard to bring you new experiences (more on these later!). We’re already one of the best MMOs out there. This year we’re going to become even more unique and exciting. 2011 is a good year to be Norrathian. P.S., A detailed feature list of the upcoming GU 60 will be announced soon, and more elements of the longer-ranged features will roll out in successive months. This letter is just to let you know the general direction of where we’re going and what to expect. More DoV Content Already in the Can, Qeynos/Freeport Revamp in the Future? Supposedly this content is already created, as the art/lore/mechanics/etc are mostly complete. Once the base Velious is released, they will tweaks any bugs that arise, but also then be testing the content for the next GU, which would be a larger amount of time, to test and tweak, if they already have the art assets and other items already done. Yup. That’s the plan. We didn’t want to release everything at once, or else we’d get the “rip through it and leave it behind” syndrome that we’ve had in past years. So we’re releasing some of the dungeons and raids after release…but that doesn’t mean we can just wait to do them until later. As some of you have said in this thread, the GUs are important also, and we’ve got big plans for what we’d like to do this year in those GUs. We can’t create a “resource debt” by leaving DoV 1 content to be done later. So even though that stuff isn’t in at release, most of it is done already. That lets us concentrate on other stuff we’ve been dying to do, like improve PvP/BGs and revamp Qeynos & Freeport. Here are some news items we missed in the flurry of Server Merge and Freeblood news. They include Shaders 3 and Halas buildings, the look of the Freeblood, and Loitering NPCs in Freeport and Qeynos. Amnerys has posted the complete Game Update Notes for Game Update 58: Arcanum Revealed on the EQ2 Forums. Tired of getting a swift kick or a punch in the mouth from the surly and unwelcome Thexian and Dreadnaught goons occupying parts of Freeport? Killing Thexian and Dreadnaught “guards” in Freeport does not affect your faction with Freeport? If you kill enough Thexians and Dreadnaughts (about 10 of each), they will grow afraid of you and STOP WITH THE BEATINGS ALREADY? The first week of every month sees the arrival of a traveling City Festival. This month, the City Festival wraps its first tour of the five known cities of Norrath by visiting Freeport. Next month, the City Festival will no doubt make its first appearance in the newly-found New Halas. While some players have shared their exasperation with the obviousness of the ‘content delivery system’ feel to these events (repeat a runaround errand-type quest dozens of times, or craft dozens of items, to earn enough tokens to buy a few house items), others look forward to the addition of new items each time the City Festival sets down in a new city. We have been assured that each month, the cache of recurring rewards (available no matter which city hosts the event) will continue to grow even as new items are added specific to each new city. It seems we’ll be parting with two islands by May’s end. And while we’ll still be able to catch John Locke, Jack, Hurley, Sawyer, and Kate in syndication, the Qeynos and Freeport starting islands seem destined for a more permanent fate. We are providing continuing (hopefully not excessive) coverage of the impending removal of the EQ2 starting islands. If you’d like to share your story of your experiences either on the Outpost of the Overlord, Queen’s Colony, or on the original Isle of Refuge, shoot us an e-mail through the Contact Us page, or post a comment to this article. Sadly, I started playing after Isle of Refuge was changed in Game Update 19, but I have read many comments about how immersive and fun it was to arrive on a boat, battle drakes, and the Darathar storyline. We’ll assemble these stories together into an article: Remembrances of the Isle of Refuge. There seems to be some confusion in the In Testing Feedback thread regarding the removal of Qeynos and Freeport as starting choices. I stand by the original article I posted, but some clarification is worth mentioning. Qeynos and Freeport Going Away? Qeynos and Freeport are not being removed as cities. Furthermore to my knowledge, none of the level 6-20 quests in these city zones and surrounding suburbs are going away. Although further testing on the Test Server will be needed to confirm this. Players wishing to experience the Qeynos and Freeport level 6-20 content would need to create a character in Kelethin or Halas, Neriak or Gorowyn and arrange travel to Qeynos or Freeport to do those quest lines. It is also worth pointing out that changing Citizenship between Qeynos, Kelethin, and New Halas, or between Freeport, Neriak, and Gorowyn, is approximately a 15-30 minute process. It’s a single quest or short series of quests. It is nothing like Betrayal. Nor is changing your Citizenship required to play this content. 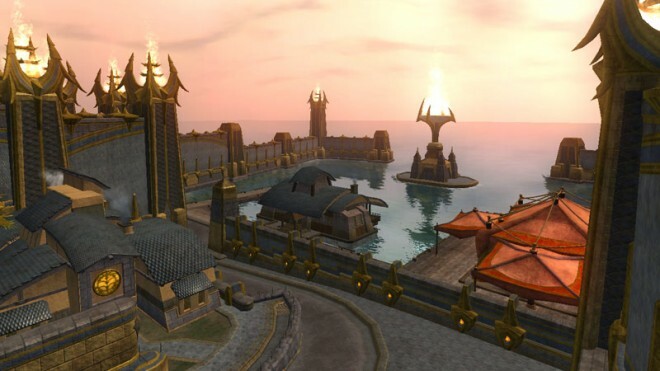 EQ2Wire would prefer if the islands are not removed, but de-emphasized from the Character Creation screen, with more options added on the Departure Boat to port the player to level 6-20 content in all 6 starting cities. We stand by our belief that removing content is not necessary to improve the experience for new players. The golden path is the first step in a larger revamp of our new player experience. We took a look at the starting areas, other than Qeynos and Freeport as we plan to move away from those, and reworked content so that it had a better flow. We wanted the quests in Darklight, Timorous and Greater Fay, to give you a better progression path. We plan to only allow new characters to start in the newer player areas. Timorous, Greater Fay, Darklight and soon Halas. The new player experience in Qeynos and Freeport are just not up to snuff anymore and do not provide as solid an experience when you enter the game for the first time. Qeynos and Freeport have been disabled as starting cities.